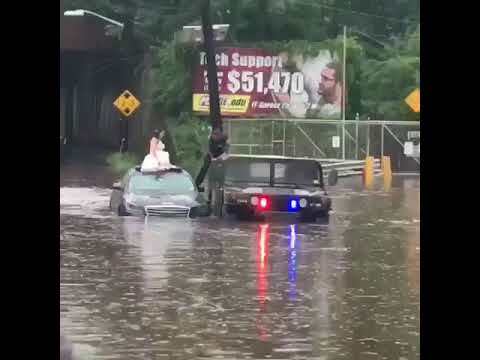 Some say you can count on at least one thing going wrong on your wedding day, but a bride and groom stranded in Bogota during Saturday’s flash flooding actually had good fortune – thanks to a handy piece of police property. "We'd usually use something else, but the water was coming up so fast, we grabbed the Humvee," Sgt. Geoffrey Cole said. 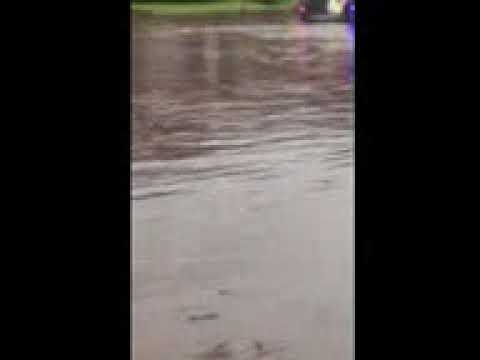 Cole and Officer Michael Laferrera reached the stranded vehicle at River Road and Elm Avenue -- an area prone to flooding -- around 6:15 p.m.
"They were shocked not just to be stuck in the water but to see us in the Humvee,' Cole said. "We were pretty shocked to see it was a bride and her new husband and their bridal party friends. Weapons and surplus military vehicles such as the HMMWV -- obtained either for free or at discount by various police agencies -- has had some critics warning of the "militarization" of local law enforcement. This time, "it just made sense," Cole said. "The water rose about four feet in less than 15 minutes," the sergeant said. Laferrera climbed onto the vehicle, stretched out his arms and helped cosmetologist Sabrina Torrens, a Rutherford native, out through the sunroof. Her new husband, Hillsdale electrician Connor Reilly, followed along with some of the guests who'd been headed with them to an after-party after their reception at The Estate At Florentine Gardens in River Vale. Torrens managed to stay dry throughout the entire ordeal, Cole said. "It's definitely not the kind of thing we see every day," he said.